Above: The mural on Main Street at Westport Road is part of The Exhibition of Open Spaces. Open Spaces is a regional, 10-week arts festival happening in Kansas City now through October 28. The festival brings work from contemporary visual and performing artists from across the globe to several locations in the Kansas City area during the exhibition. You’ll find art in parks, in urban spaces and in galleries, and you can take RideKC to experience this world class arts and cultural festival. 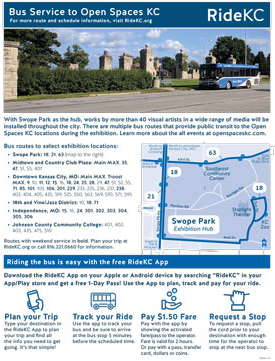 RideKC is providing a transit guide, available at Visit KC. It will help you get to the various venues, which include Swope Park, Johnson County Community College, Independence, the Jazz District, and Downtown KCMO. 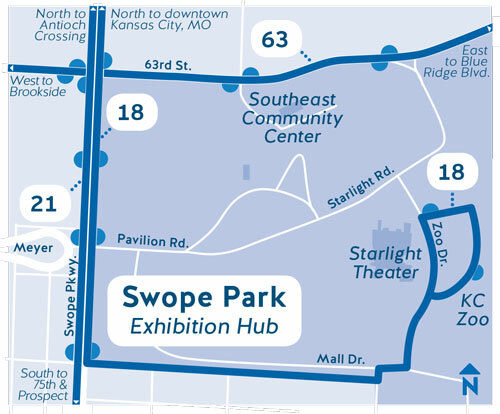 Swope Park is the exhibition hub and is easily accessible by routes 18 Indiana, 21 Cleveland-Antioch, and 63 63rd Street. The Exhibition: More than 40 contemporary art installations in Swope Park and throughout Kansas City. Works a wide range of media are installed throughout the city. There is no admission charge for to see works in The Exhibition. The Village: Every weekend at the Maker’s Pavilion in Swope Park, there will be performances, handmade goods, food and more. Performances at The Village are free. The Weekend: A special series of concerts at Starlight Theater in October will include The Roots, Janelle Monae and the Vijay Iyer Sextet. Araminta is a sculpture by Joyce J. Scott. 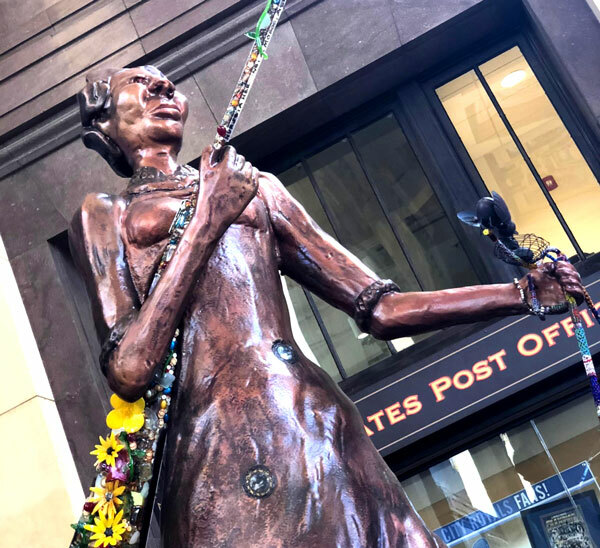 The piece at Union Station depicts American abolishist and political activist Harriet Tubman.